Ravichandran Ashwin became the highest Test wicket taker for this year, after taking the wicket of Jean-Paul Duminy on Day 3 of the third test between India and South Africa at Nagpur, thereby overtaking England’s Stuart Broad, who has taken 51 wickets in 13 matches for England this year. Ashwin, who has played only 8 matches, has more wickets than Broad now in this year, and will increase his lead over the Englishman even more by the end of the current series. 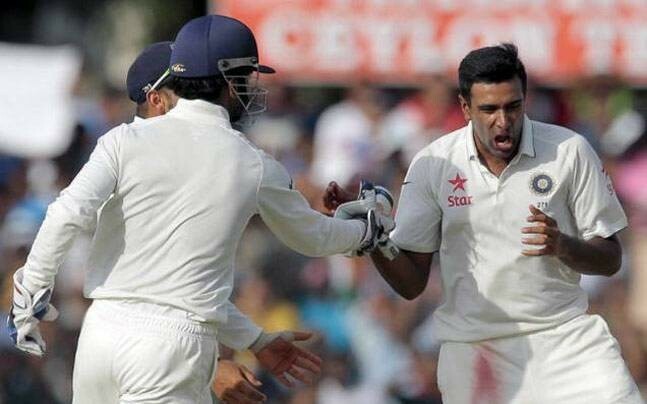 R Ashwin is by the far best off-spinner in the world right now, also becoming the fastest Indian to take 150 wickets in test cricket earlier this year, during the 1st test at Mohali. 2015 has been the best year for Ashwin, as can be seen from a breakdown of his yearly performances in test matches. In this series, he has taken more wickets than anybody else. He has taken 24 wickets in 3 matches so far with three 5-fers and one 4-fer. Next to him is India’s Ravindra Jadeja who has taken 16.wickets so far in three matches. Here is a table that includes all other nine bowlers barring Ashwin who have taken the most wickets this year in test cricket. Here is a table that shows top 4 India’s highest wicket takers in tests this year. Here is a table that shows how R Ashwin has taken wickets of batsmen so far in his test career. In his test career of 5 years, he has taken 169 wickets in 31 test matches. Here is an another table which shows how many times Ashwin has taken wickets of top order batsmen, middle order batsmen and tailenders.